NOTICE: Activation key must be used on a valid Steam account. Requires an internet connection. About the game Vault-Tec engineers have worked around the clock on an interactive reproduction of Wasteland life for you to enjoy from the comfort of your own vault. Included is an expansive world, unique combat, shockingly realistic visuals, tons of player choice, and an incredi… ble cast of dynamic characters. Every minute is a fight for survival against the terrors of the outside world — radiation, Super Mutants, and hostile mutated creatures. From Vault-Tec, America's First Choice in Post Nuclear Simulation. Key Features Limitless Freedom! Take in the sights and sounds of the vast Capital Wasteland! See the great monuments of the United States lying in post-apocalyptic ruin! You make the choices that define you and change the world. Just keep an eye on your Rad Meter! Experience S.P.E.C.I.A.L.! Vault-Tec engineers bring you the latest in human ability simulation — the SPECIAL Character System! Utilizing new breakthroughs in points-based ability representation, SPECIAL affords unlimited customization of your character. Also included are dozens of unique skills and perks to choose from, each with a dazzling variety of effects! Fantastic New Views! The wizards at Vault-Tec have done it again! No longer constrained to just one view, experience the world from 1st or 3rd person perspective. Customize your view with the touch of a button! The Power of Choice! Feeling like a dastardly villain today, or a Good Samaritan? Pick a side or walk the line, as every situation can be dealt with in many different ways. Talk out your problems in a civilized fashion, or just flash your Plasma Rifle. Blast 'Em Away With V.A.T.S.! Even the odds in combat with the Vault-Tec Assisted Targeting System for your Pip-Boy Model 3000! V.A.T.S. allows you to pause time in combat, target specific body parts on your target, queue up attacks, and let Vault-Tec take out your aggression for you. Rain death and destruction in an all-new cinematic presentation. Mind-Blowing Artificial Intelligence! At Vault-Tec, we realize that the key to reviving civilization after a global nuclear war is people. Our best minds pooled their efforts to produce an advanced version of Radiant AI, America's First Choice in Human Interaction Simulation. Facial expressions, gestures, unique dialog, and lifelike behavior are brought together with stunning results by the latest in Vault-Tec technology. Eye-Popping Prettiness! 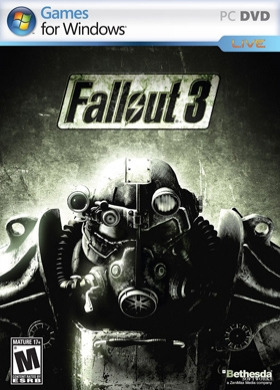 Witness the harsh realities of nuclear fallout rendered like never before in modern super-deluxe HD graphics. From the barren Wasteland, to the danger-filled offices and metro tunnels of DC, to the hideous rotten flesh of a mutant's face. System Requirements Windows - Minimum OS : Windows XP/Vista/Seven Processor : 2.4 Ghz Intel Pentium 4 or equivalent processor Memory : 1 GB (XP)/ 2 GB (Vista) Hard Drive : 7 GB available space Graphics : Direct X 9.0c compliant video card with 256MB RAM (NVIDIA 6800 or better/ATI X850 or better) Sound card : DirectX 9.0c Controller support : Xbox 360 controller *Requires log-in to Games For Windows - Live Windows - Recommended OS : Windows XP/Vista/Seven Processor : Intel Core 2 Duo processor Memory : 2 GB RAM Hard Drive : 7 GB available space Graphics : Direct X 9.0c compliant video card with 512MB RAM (NVIDIA 8800 series, ATI 3800 series) Sound card : DirectX 9.0c Controller support : Xbox 360 controller © Fallout® 3© 2008 Bethesda Softworks LLC, a ZeniMax Media company. Bethesda Softworks, Bethesda Game Studios, ZeniMax and related logos are registered trademarks or trademarks of ZeniMax Media Inc. in the U.S. and/or other countries. Fallout, Prepare for the Future and related logos are trademarks or registered trademarks of Bethesda Softworks LLC in the U.S. and/or other countries.